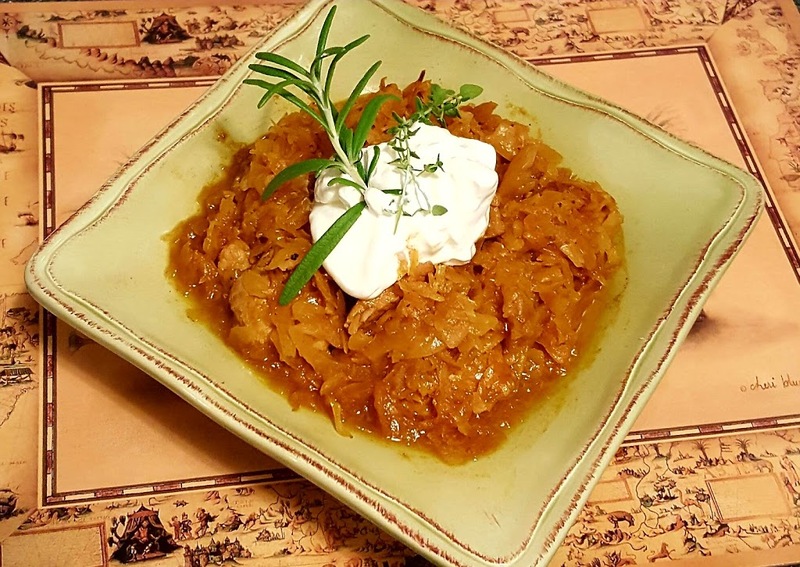 This popular Hungarian Székely Gulyás dish is said to have been originally created in the town of Szeged which is the third largest city in Hungary, others believe that this dish was named after the famous Hungarian writer, and screen writer János Székely. 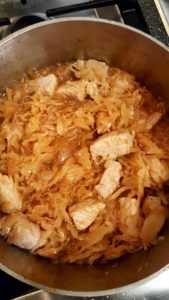 The name may sound unusual or complicated but it’s a very simple to make pork and sauerkraut stew. This recipe version is one that Mom used to make on occasion during the winter. My brother and I both loved this stew when she served it and later on my family, even my picky kids, loved it. One of the best things about this recipe is the pure simplicity of a few ingredients left to simmer and mellow into an extraordinary blend of aromas and flavors. These ingredients really do work well even if at the outset you don’t think it would. (Like me!) I was very surprised that Mom added the sour cream to this dish the first time, but it works! This dish is also fine without the sour cream but it does enhance the dish with a richer broth. 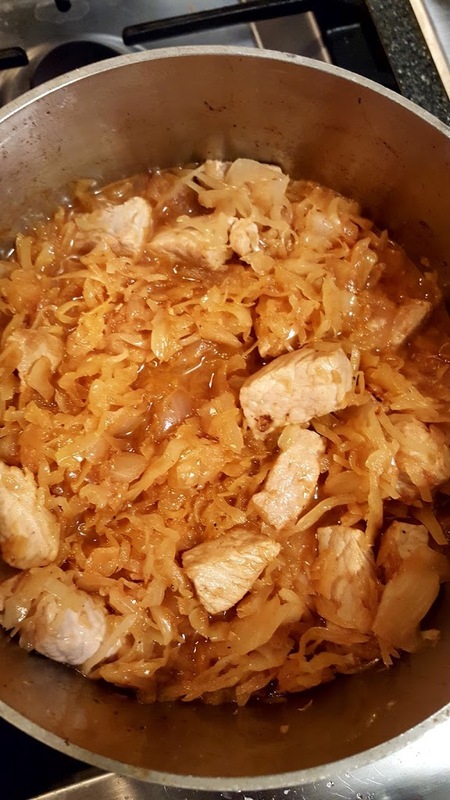 The sauerkraut from the cooking loses some of it’s bite and mellows into a delicious shredded sauce. If case you don’t know much about Hungarian paprika, it has more flavor than the run of the mill brands in many stores labeled as just “paprika”. It’s much easier to find now than it was years ago. The Hot paprika can pack a good bit of heat so…add slowly if you’re not a spicy food lover. If you’re familiar with the Scoville Scale of peppers, Hungarian Hot Paprika is around 500 while ancho chilis are about 1500 Scoville units and cayenne pepper is up around 30,000 to 50,000 Scoville units. By contrast the Sweet paprika is rated at 0 for heat on the Scoville Scale. I firmly believe that when you cook you should prepare recipes to your family’s taste. 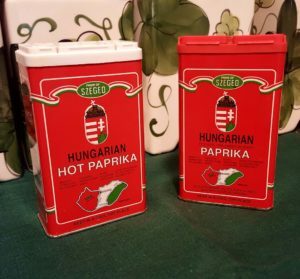 If you don’t like spicy…please by all means use just the Sweet paprika but 2 Tablespoons instead of the 1 Tablespoon of each type as listed in the recipe. If you love spicy….go ahead and go all Hot paprika. A great addition to this recipe would be to substitute a few slices of diced bacon in lieu the oil to brown the meat. If you use the bacon, cook that till almost crisp then remove the pieces from the Dutch oven before adding the meat so there will be no chance of the bacon pieces becoming overdone or blackened. This is a great weeknight meal since you can easily prepare this ahead on the weekend and serve later. Like most stews and soups the flavor improves as it sits so the ingredients absorb all the flavors from each other. Trim and cube the pork into 1 inch cubes. Cut onion into a course chop. Since this will cook down and blend into the sauerkraut the pieces need not be small. Drain the sauerkraut and reserve the juice. 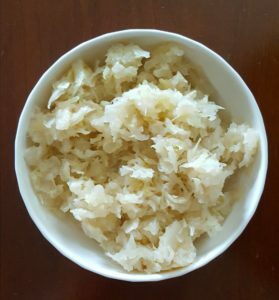 I always like to check for salt and acidity before using the sauerkraut in cooking. If the sauerkraut is too salty, go ahead and give a quick rinse. I like to save that juice to add more flavor if needed later. If the sauerkraut is one you could eat as is…go ahead and add the juices to the pot when it’s time to add the sauerkraut. Like a bit of heat in your food? Heat a Dutch oven and then add the oil to heat till it shimmers. Slowly, and in batches add the pork cubes making sure their surface is dry so they brown a bit to add even more flavor. As they brown remove each batch to a plate before adding more. Next add the onion and sauté until just starting to brown. Return the pork cubes to the pot, add the sauerkraut plus the paprika and just a bit of black pepper. (If you did the bacon instead of oil add it back now.) You can always adjust salt and pepper later. Add the sauerkraut and use as liquid either the kraut juice or some water so the meat will stew just to barely cover things. Cook covered over low heat and check the meat for tenderness in 50 minutes. It will probably take longer than that to finish. Continue cooking the pork is very tender and the meat almost starts shredding. Székely Gulyás ready to simmer. Notice it’s not totally covered in liquid. If you have made the stew ahead, when your ready to serve heat to serving temperature. Now add the sour cream and stir well. I have also completed this dish with the sour cream addition and then stored overnight before serving. If you don’t like sour cream this dish still has nice flavor without the addition. I prefer serving this in bowls with some nice crusty bread or biscuits on the side. As always love to hear your comments and suggestions on all recipes.